Eileen Neff’s 3-week residency in Costa Rica produced some lush images of animals, plants and birds dealt with in Neff’s anthropomorphic way. 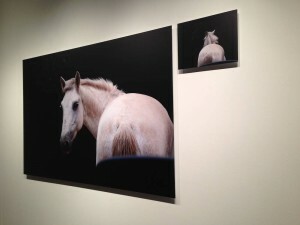 Listen to the brief (5 minutes) audio of gallerist Bridgette Mayer talking about the works, then go have a conversation with the standing and seated leaves, and the horse, whose gaze is captivating. Perfect show to transport you to another climate, when you really need it. The show is up to April 18.